During the 60's Topps had a very lazy or intimidated photographer. 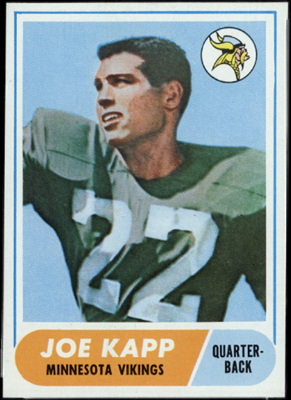 Five times they used the same photograph for Joe Kapp, keeping him in a green uniform even when he was on the Vikings. 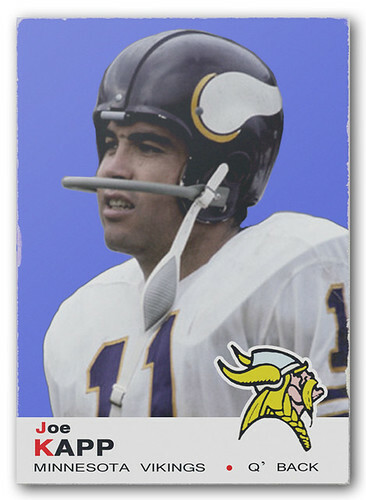 I decided to fix it (somewhat) Here are remakes of the 1968 & 69 cards, showing Joe as he should have / could have been. 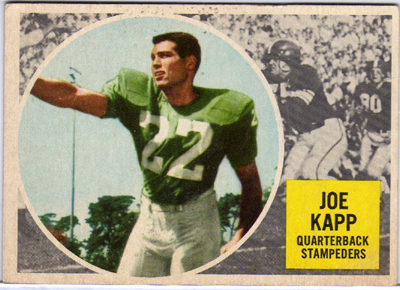 If you've ever collected Football cards, I thought you might enjoy this. As far as I know neither the Calgary Stampeders nor the B.C. 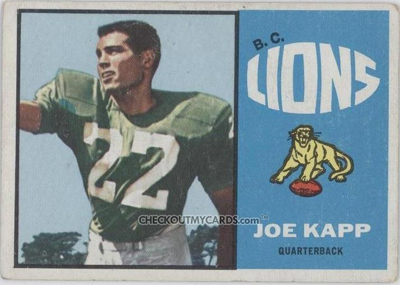 Lions ever wore green uniforms. Nice work on the jersey changes. Now they look they way they way they should have looked to begin with. I'm not sure exactly where the green came from, but the originals look more like the uniform he wore in college at Cal, rather than anything he wore in the CFL or NFL. Based upon research, I suspect it has nothing to do with laziness, it has to do with licensing. 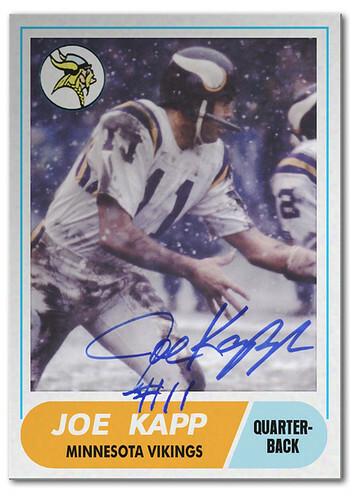 Topps did not have the licensing rights to the NFL until 1982, so they wouldn't have had the ability to reproduce NFL helmets, logos, or uniforms (which is why you might notice that the Vikings' logo isn't right either). They only had the licensing rights to the AFL teams. The explanation could be something even simpler. The card looks like an artist's rendition of a photograph that was probably shot in black and white. 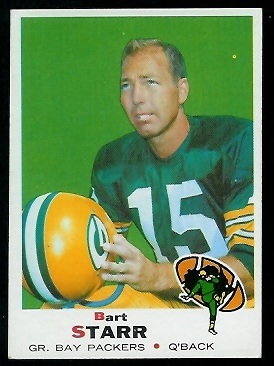 Bart Starr was definitely in the NFL. 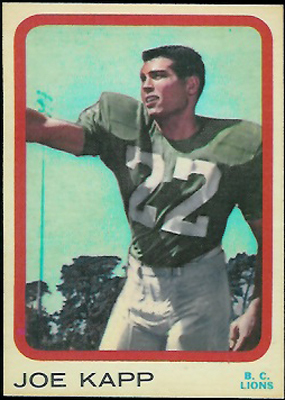 At the time they could put up logos - you see team logos on the corners of the cards, they just preferred head shots. 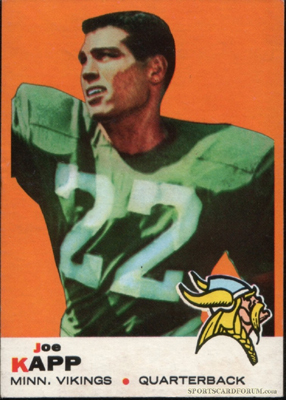 Beside Bart Starr, Alex Karras, Ray Nitschke and various other players are holding their helmets with the decoration on them. The uniforms could always be see - even in the 70's when they were airbrushing helmets in a color not found in nature. From '70 to '81 the logos were gone resulting in a lot of head shots, sideline shots and some weird looks from confused eight year olds. After that the logos returned. BTW, after looking at your link I do think it was a Cal picture. I know some shots got reused but this sets some kind of record.